I was on my way up to the swings when I came across him. 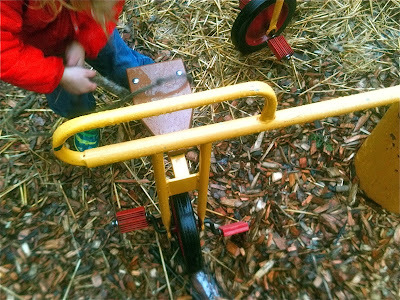 He was manipulating a rope, wrapping it around one of the seats on our unicycle merry-go-round, a two-year-old, engrossed in his endeavors. I stopped to watch, which is, after all, my primary classroom role once the kids have arrived on the scene. After wrapping it to his satisfaction, he took the other end and began to walk away, pulling on the rope as he went. My guess was that he was attempting to use the rope to turn the merry-go-round. 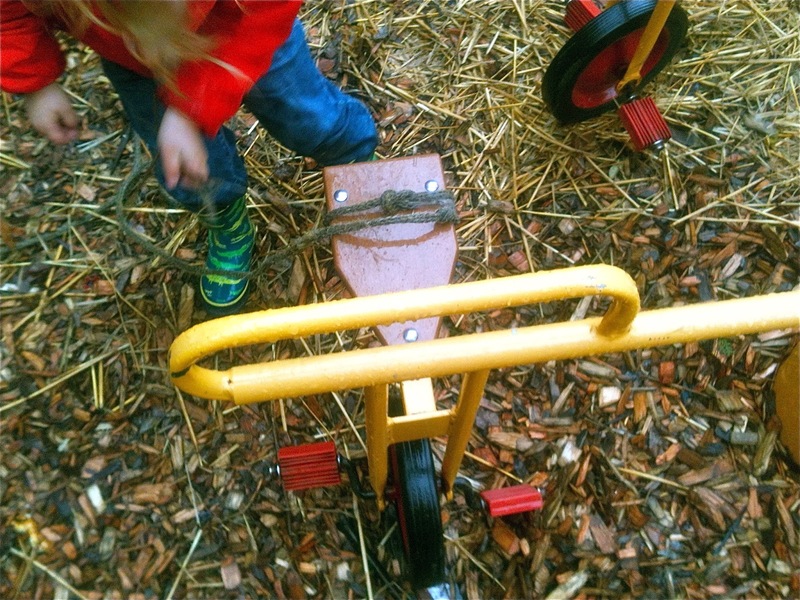 It worked: the wheels on the apparatus turned a couple revolutions before the rope slipped off. That's when he looked up at me. As he picked the rope off the ground, he said, "I have to tie it again." Now, I guess with me as his audience, he began narrating his actions. "I'll tie it like this," once more wrapping the rope around the seat. "That's tied," he announced as he took the opposite end of the rope and began to pull. This time, having apparently learned from his previous attempt, he walked it back quite slowly, carefully, concentrating his full attention on the rope where he had "tied" it. This time the rope slid right off without budging the merry-go-round. His eyes followed the length of the rope from where it fell to the ground to his own hands, which brought the magnifying glass that lay on the ground at his feet into his field of vision. 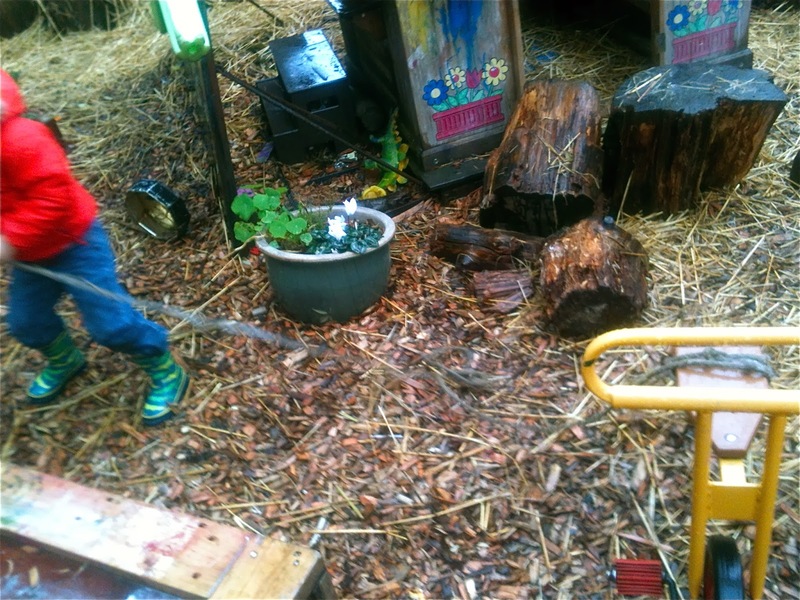 He released the rope, picked up the magnifier, dropped to a squat, and began to use it to look at the strawberry plants in our garden. I stood there wishing he would have continued his efforts with the rope, waiting for him to come back and resume his efforts after this strawberry diversion, but then it was on to a hands-and-knees crawl into the sand pit where he began to use the magnifier as a shovel, the next link in his chain of exploration and discovery. It's a prejudice I have, this narrow idea of what deep, tinkering play is all about. I wanted him to work diligently on what I saw as his "original" project, when, in fact, it was just part of a flow that was taking him around, across, and over our space, noticing, touching, and fiddling, his hands moving him from item to item almost like a swimmer moving water with his cupped hands, to propel himself forward. 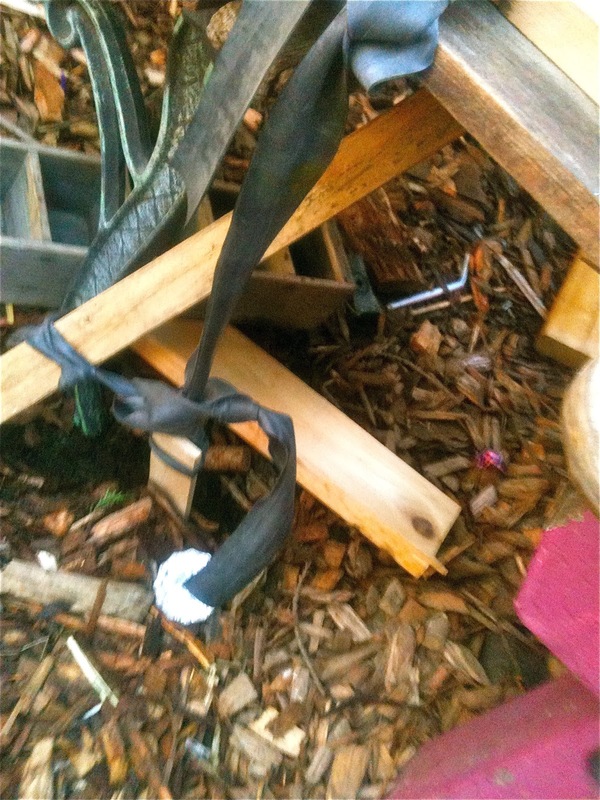 Later that day, five-year-old Henry arrived with a length of bicycle tire tubing. 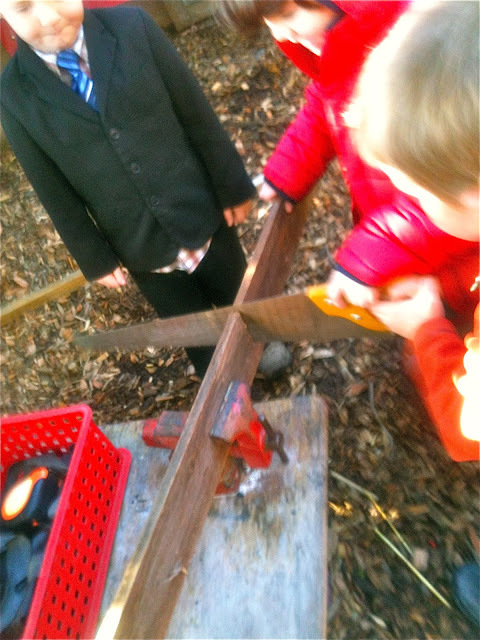 He thought we could use it to build a "giant catapult" or "at least a giant slingshot." Henry's been experimenting with increasingly dangerous teeter-totter style catapults for weeks now, usually seeking to launch buckets of water or large heavy rocks, most often succeeding in just missing his own head. He once tied himself to one of the uprights on our monkey bars as a "safety harness" designed to keep his body away from the danger zone only to figure out that he now couldn't reach his catapult to activate it. I recognized the rubber tubing as the next step in the evolution of his thinking on catapults. 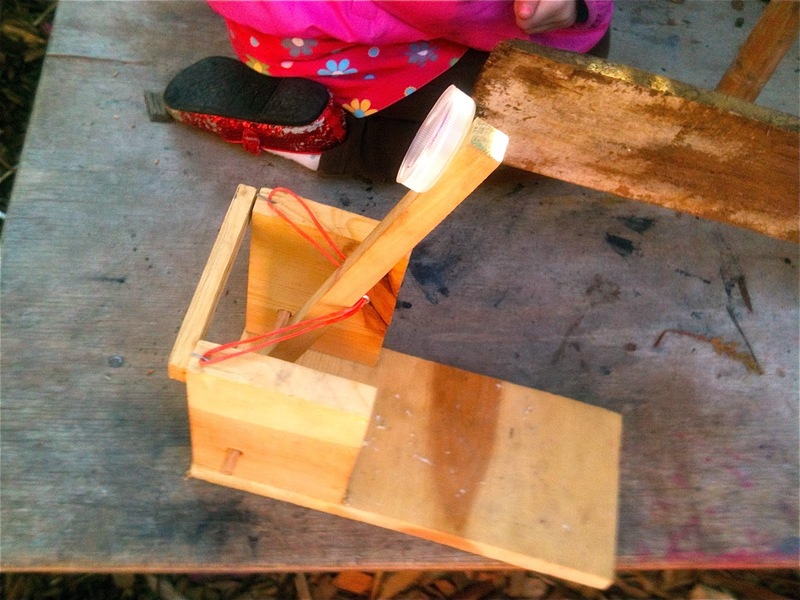 Coincidentally, or perhaps unconsciously inspired by his play from the preceding weeks, I had our box of small, homemade catapults ready for action. I said, "We'll be using our small catapults at the workbench later today. Let's study them to figure out how to build the giant catapult. He thought that sounded like a good idea. 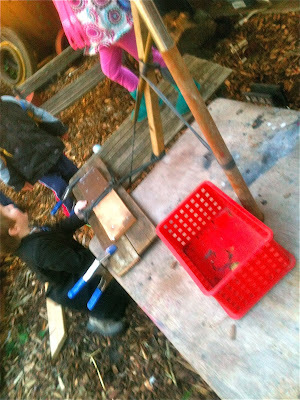 Yesterday, we got to work on building a giant catapult. I happen to have been collecting bicycle inner tubes for some time, so, inspired by Henry, I brought out the box. 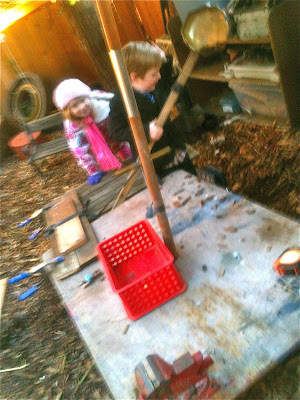 Several kids joined us at the workbench as we got to work. Henry was not particularly interested in my idea of making a studying the smaller catapult, but rather wanted to just get to work with his hands. His process was to begin attempting to attach the rubber tubing to this and that, examining torque and tension. Gus and Audrey, however, were motivated by the idea of first collecting all the materials we would need. 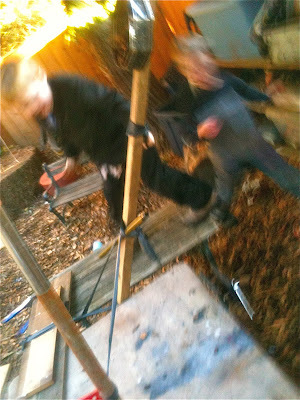 So as Henry monkeyed around with his experiments, we scavenged around our outdoor space, coming up with a six foot length of 2X2, an cookie tin, and a length of old fence planking we thought we could use to form a base. By the time we returned, Henry had moved on to other games, but Xander and Connor had joined us. Gus let us know that the fence plank would need to be sawed in half. We would then nail the two halves together side-by-side to form the base. I could have recommended a single piece of wood that was already the proper size and shape for his purposes, but where's the fun in that? Everyone agreed that we would need a measuring tape, which we used to calculate, after much bickering, where we needed to cut in order to have two equal halves. Gus marked the spot with his thumb until I made a cut line with a Sharpie. 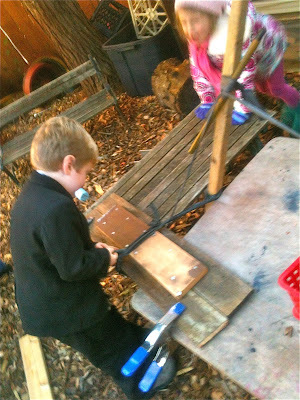 We mounted the plank in a vice. By now Henry had returned. He was quite bold and confident in his sawing abilities, so we all stood back as he backed up his words, making short work of it. As he got to the end of the cut, it looked as if the final bit was just going to break off, so Audrey held the end to ensure a smooth cut. Gus grabbed the two pieces, but was disappointed to find that we'd miscalculated. One of the pieces was about 3 inches longer than the other. He again showed me were to draw a Sharpie line. We remounted the plank and this time Henry and Connor teamed up to do half the sawing, followed by Xander who finished it off. 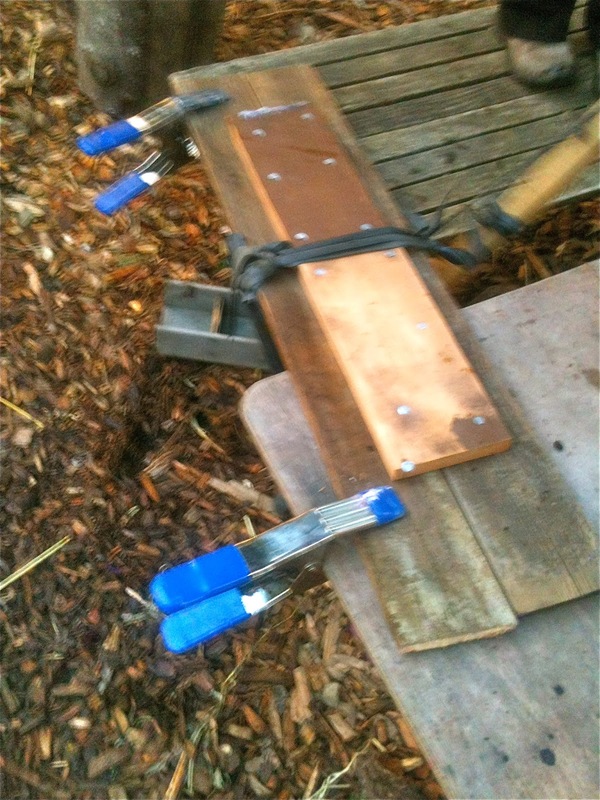 We now had the problem of how to attach the two equal pieces of plank side-by-side. Checking our nail supply we found that there were no nails long enough to drive through the sides (not to mention that I, as an adult with a little experience with woodworking, knew that we would simply split the wood if we tried). Gus suggested that we needed to nail something to the top that held them together. We found an apt piece of wood in our scrap box, then a second one just in case. By now it was just Gus, Xander, and Audrey working together. We decided it would take 12 nails to do the trick, taking turns driving them. It was time to go inside, so we left the project for later. I was the first one back out, so I thought I'd take matters into my own hands by nailing the inner tube and cookie tin to the catapult's arm while I waited for the kids. Henry was immediately irritated with me for what I'd done with the inner tube, saying, "That's wrong, Teacher Tom," although he approved of my work on the cookie tin. When Gus and Audrey arrived on the scene, I showed the kids the smaller catapult, detailing the parts we had already collected and pointing out the parts we didn't have. Gus took a close look, and said, as if talking to himself, "We'll need that part and that part . . . Then we have to drill a hole there . . . I think we can do it a better way." He took the two ends of the inner tube I'd nailed to the arm, saying, "We just need to tie the ends to something." He decided on the umbrella that emerges from the center of our work bench and the leg of a nearby table which we dragged over for the purpose. By now it was just Gus, Audrey and me. 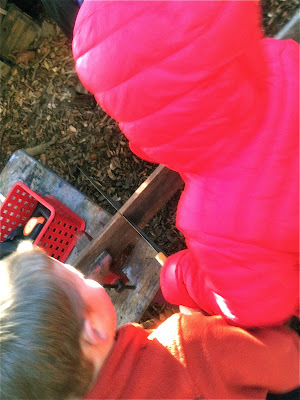 At some point, my idea of nailing the inner tube to the arm proved faulty (as Henry had predicted). Gus' repair was a work of genius, one that I almost kiboshed before realizing what he had up his sleeve. He wove a metal bar through the inner tube, then we just kept twisting it until the tube was held tightly in place, not libel to tearing as it had with my nail technique. At one time we had a catapult that instead of launching things, would kick pieces of wood out the bottom. Gus announced, "We invented a cannon!" 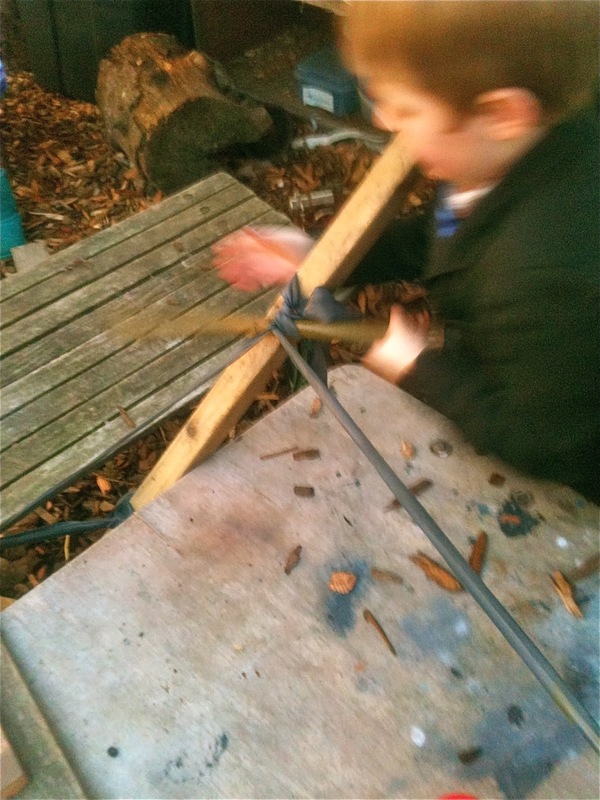 and there was some cheering, but the catapult work continued apace, Gus focused on figuring out how to create a pivot point for the bottom of the catapult arm without having to resort to drilling. In the meantime, Audrey had assumed the role of keeping everyone safe, arranging caution cones around the perimeter and warning us about the potential for getting things in our eyes. By the end of the day, we finally managed to launch a small green truck about 6 feet. We left it there, a work in progress, the plan being to work on it again today. It's all about flow, cupping our hands and propelling ourselves forward, not knowing exactly where we're going, but going nevertheless, one thing to the next.